4. He fails to look for the action of Hering's three Laws of Cure: That the remedy works from within outward, from above downward, and in the reverse order of the symptoms. (This never happens, except under the action of the curative homoeopathic remedy). 5. He omits to make ??? of the "second-best remedy", i.e. , Sac. Lac. Thereby, he sometimes loses the patient's confidence, especially that of those who are accustomed to taking much medicine. 6. He fails to make sure that the patient has actually taken the remedy. (Wherever possible, always administer the dose yourself). Or, he fails to find out what other remedies the patient may be taking or what dietetic interferences there are. The physician must be cognizant of what substances interfere with the action of our different remedies, as coffee with Nux vom., or acids with Acon. 7. He does not search out the psychological and sociological deterrents to cure and teach the patient how to evade and overcome these. 8. He sometimes does not recognize soon enough when the remedy is not working, and is then often too busy to revise the case, and try again to find the most similar remedy. 9. He permits himself to give minor remedies for trivial or temporary ailments incident to chronic treatment, when Sac. lac., or sensible adjuvants such as hydrotherapy would suffice. 10. He changes remedy because of the out-cropping of other symptoms, symptoms due to idiosyncrasy, and symptoms returning under the chronic remedy (which the patient may never recall having had before and actual new symptoms which occur because the remedy was only partially similar, and, finally, symptoms of some discharge-such as coryza leucorrhoea or perspiration-which represent a curative vent and are due to the action of the remedy. 11. He gives the wrong potency of the right remedy. (If sure of the remedy, it is well to try another potency, or, first, three doses of the original potency at two or four hour intervals. NB.-Always instruct patients to stop taking the remedy as soon as appreciable amelioration sets in, and to switch to the "second" remedy, i.e. Sac. lac.). 12. He gives too high a potency in an incurable case, or one with marked pathological changes, and so induces an aggravation with which the vital force cannot cope. (If he has done this and the patient is going down-hill, he must antidote). 13. He gives a profound constitution remedy to a case which is too sick to stand it and should have merely a related palliative remedy. for instance, in incipient tuberculosis it is dangerous to give Sulph., Sil. or Phos. at least in high potency. A single dose of the thirtieth (30th) is a high as he should venture. If the case is far gone in tuberculosis, these remedies must not be given, but rather a palliative for the most distressing symptoms, such as Rumex, Sang., Puls., or Seneg. 14. He must remember that certain remedies are dangerous to mishandle. For instance, Kali carb., especially in cases of advanced arthritis; or Sil., where an abscess, if suppuration were brought on, would break in a dangerous location, as in the lungs; or some of the nosodes, like Psor. which, in deeply psoric cases say of asthma, may induce terrific aggravation; or Lachesis, whose improper repetition may engraft a permanent unfavourable mental state on the patient. Arsenicum is another dangerous remedy. when apparently indicated in the last stages of an acute disease, say pneumonia, it may hasten demise although it will make the death tranquil, but it will not rally the patient as one might expect. In the terminal stages of chronic disease, where cure is impossible, it will sometimes bring the patient back long enough to sign a will or see the family, and will ultimately induce euthanasia. 15. He will often be surprised to find that certain symptoms or groups of symptoms are relieved by his remedy and yet the patient feels worse or develops more deep-seated trouble. In this case, the prescribing has been superficial and suppressive. Suppression is perhaps the greatest danger of ordinary medicine from the point of view of homoeopathic philosophy, and the deep homoeopath must be constantly on his guard not to produce suppression with his remedies. If he has given an acute remedy for an apparently superficial trouble which is relieved but the patient feels badly, he should do the chronic case at once, and the deep acting remedy will right matters. 16. He may give remedies in the wrong order or inimical remedies in succession, thereby aggravating the patient and mixing up the case. 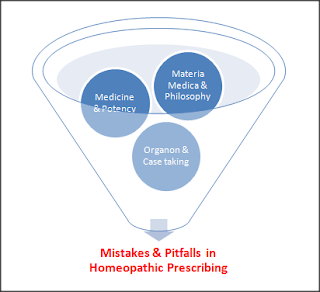 Throughout his practice the physician must sell the idea of homoeopathy with brief but helpful explanations to the patients in order to insure their co-operation. He must himself have the character to sit tight when he knows what he is doing and not spoil his cases by unnecessary and harmful prescribing. Above all, he must consider each patient as an opportunity for service not only to the individual and the community but to homoeopathy and to the race. Ref: A Brief Study course in Homeopathy, by WRIGHT-HUBBARD E.